The Garaventa Stair-Trac is a portable wheelchair lift that attaches under most standard wheelchairs and can be used indoors or outdoors. It allows an attendant to easily move a person in a wheelchair up and down stairways with the touch of a button. 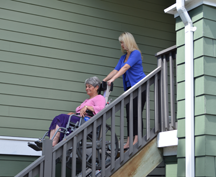 The Stair-Trac is an affordable access solution that is available immediately. On school field trips, church excursions or weekend drives, this portable wheelchair lift is easy to load into vehicles using the optional loading ramp and fits in most car trunks.